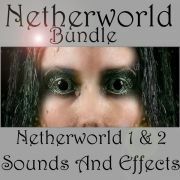 The Netherworld Bundle includes all of Netherworld and Netherworld II With Fright Violins at a special price. 'Netherworld' by Sounds And Effects features all new digitally created sounds that inhabit the dark places between musical sounds and sound effects. Odd rumbling noises, strange insects swarming, dark distant choirs, ominous drones, screeches, thumping, clanging, ripping, torment, mysterious spatial ambiences, warbling distorted grave yard bells, and unearthly beasts feeding way down below. 'Netherworld' also includes boomy percussive sounds, and clipping or cutting noises reminisant of something bad happening. 'Netherworld' is very musical, but odd, eerie and haunting. The presets make full use of Kontakt or Reason's multipole filters, envelopes, lfos, and effects, and generally use the modwheel and aftertouch to either control a filter's cutoff frequency, or to fade between differing variations of a sound. Many presets crossfade to an entirely different sound via modwheel, while filter can be controlled by aftertouch. All the sounds in the demos are included in the library. Voices, perc, everything. Demos 1 and 2 show some of the musical possibilities, demo 3 is more oriented towards sound effects. 'Netherworld II: Fright Violins' starts where its predecessor left off, adding frightening and eerie violin special effects, such as slides, pitch dives and rises, and tremolando, special bowings, screeches and squeals generated by playing on the wrong side of the bridge. There are long drawn out soundscapes, as well as metallic scrapes, big deep booms, distorted bells, processed male and female screams, and much more. The sounds of dark terror night forest ambience, strange night winds, humans being pursued by various monsters, or trotted off through an eerie jungle to a human sacrifice, are included. In addition to that, there are more traditional monsters, like werewolves, zombies, vampires and bats, apparitions, ghouls and ghosts, haunted houses, and processed breaking glass. The Kontakt and Reason presets generally make use of the mod wheel to control filter cutoff, or to crossfade to another version of the sound.